As strange as it may seem, troubles in Afghanistan are very much linked to the downturn in the global economy and the drug wars raging in the Western world. 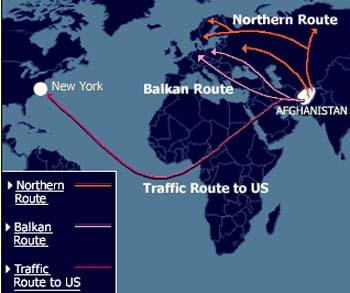 The West is flooded with cheap opium, the bulk of which (93 - 97%) is now coming from Afghanistan. The drug trade accounts for half of Afghan's GDP (according to National Security Network). The chart below (from the UN's World Drug Report 2009 - see embedded below) shows Afghanistan's dominance in opium production. Even though most heroin sold in the US is cultivated in Mexico and South America, one fact remains - the street cost of heroin in the US has dropped to $250 an ounce (in 2009), compared with roughly $800 some ten years ago. Sadly that price drop is destroying the Afghan economy and spurring violence. Before 9/11, the so-called Northern Alliance fought the Taliban for years, ultimately losing most of the territory they used to control. With the US support, they were able to overcome the Taliban and regain power. But their war wasn't about Afghanistan's liberty or some other ideals. The Northern Alliance war lords that ultimately became Karzai's regional leaders, wanted one thing - to regain the control of the poppy fields and distribution channels for opium. It all fell into place for them after 2001. The US provided stability, Karzai looked the other way to maintain control, while Tajikistan, Uzbekistan, and particularly the friendly Kyrgyzstan (ex-Soviet republics to the north), as well as Russia provided excellent distribution routes into northern Europe and the Far East. By the way if you are an attorney looking for work, here is your opportunity to become a Resident Legal Advisor in Kyrgyzstan working for the US Justice Department. You would be assisting the local authorities to fight drug trafficking from Afghanistan as well as local production. But be careful because Kyrgyzstan may legalize opium and you will be out of a job. Pakistan and Iran were also there to move inventory into Western Europe and Africa - some ultimately headed for the US. Ironically it is rumored that some ex-Taliban who resettled in Pakistan were and still are providing distribution support. This industry became a well-oiled machine. The Report shows a downward trend in major drug markets. Opium cultivation in Afghanistan, where 93 per cent of the world's opium is produced, decreased by 19 per cent in 2008. With prices collapsing, driven by the global recession, and production down, there is no longer "enough to go around". Margins are thinner and those participating are not getting paid the way the used to. Th economy is in perils as nearly half the GDP is impacted directly. And that is leading to the rapidly escalating violence in Afghanistan. As important as stability of Afghanistan is, it will be nearly impossible for NATO to generate stability without replacing the revenues from opium. The Afghan conflict is becoming increasingly more expensive for the US in part due to the global slowdown and drop in prices. Ironically the economic downturn is also the reason the US and NATO can ill afford to wage this war. Since this is effectively a "war on drugs", maybe it's time of others who are impacted by opium (and have the resources) to step up and help with the conflict.